Finally, Mythos was habitable. The day was bright, light bouncing from the structure of The Aedekata and shimmering over the cobblestone streets even though Winter was beginning to wake from slumber. The buildings of The Metropolis were strung with white and silver streamers and twinkling fairylights, and upon the steps of the grand Temple stood four animals, looking over their proudest creation. A white hare, a black raven, a gentle stag and a mottled shetland pony stood together, quiet for a moment. Even for deities as powerful as they, this was an indescribably important day. It was the day they welcomed civilians into their home, to thrive in the new lands and enjoy all that they had strived to create. Pantheon was no longer a dead land, it was revived. Renamed, yes, but the essence of what was Pantheon remained. They wondered if any former residents would return to see what had become of their world. Silence stretched on until the white hare hopped forwards, white ears lined with pink flopping forwards over her face and covering her silver eyes. The hare twitched her nose and smiled before addressing her people with a sweet voice, "Welcome," she shuffled forwards an inch more, "To Mythos. My name is Aeternitas, Goddess of Time and Eternity. My siblings and I have worked for many years rebuilding the lands you might've once known as Pantheon, wanting for them to be habitable once more. It is now, finally, that we open them to you. We encourage you to go, disperse, discover your magic and thrive upon our grasses. We will be watching over you, always, with full hearts and overflowing pride." It was then that the dark raven cawed, a sound that echoed through the streets and appeared to mock the Goddess, who was now hopping backwards once more. The hare cast an annoyed look at the bird, but the bird merely appeared to smirk. Without moving an inch, it opened its beak and spoke with a voice far deeper than that of her sister, "I am Morta, Goddess of Death. Know that I hold in my heart far less mercy than my siblings." she scoffed, "For now I will watch with them silently, but I warn you to fear my presence." The chocolate stag huffed a breath through flared nostrils, raising his head and mossy antlers to offer his piece with gruff intonation, "I'm Terra, God of Life." his words were curt but seemed odd from his tongue, as if it was not his usual persona, "I apologise for my sister," he made a point of ignoring the twittering raven, "and wish you to know that I shan't allow her to get away with any unnecessary unkindnesses. Please, do not fear us." the stag turned then to the shetland who kindly shook their head and took a step back, into the shadows. Terra nodded in understanding and made an introduction for the fourth deity in their place, "This is Suadela, Deity of Love. Do not mistake their quiet for rudeness: they care for you just as much as we." Suadela nodded in agreement. Perhaps it was misleading for the Deities, the founding four, to present themselves in their most common shapeshifted forms, however they didn't mean it so. It was tactical not to reveal their equine appearances just yet - who knew what kind of creatures they would encounter. This way, they were far better equipped to be stealthy, as even their current forms were difficult to distinguish when they did not stand high upon pedestals. After another stretch of silence, the pearl hare raised its head a final time, "We are so excited to meet you, citizens of Mythos. Come, make yourselves at home." The Deities of Mythos welcome you to their world! Feel free to respond with characters, interact with each other! The short while he had found himself in this lovely land, Tempest had avoided the Temple. He had deliberately looked the other way whenever he was forced to walk near it... Which was not that often, considering how massive the city was and how winding the streets were. There was something about a place of worship that made him uneasy. He knew exactly why he felt that way, of course. It was hard not to when it had defined his entire youth. That didn't mean he had to acknowledge the existence of the building or even go near it. Unfortunately, voices reached his ears as he finally made the decision to visit this Black Hornet pub that he had heard so much about. They came from the steps of the Temple but drew him closer against his better wishes. He came into range to hear clear words instead of a simple blurring of sounds just in time for the stag to speak. Tempest's ears flickered forward in intrigue as he apologized for his sister - Sister? 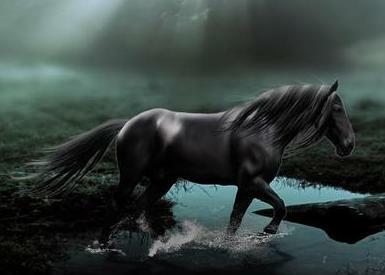 the stallion wondered, eyeing the hare, raven, and pony at the stag's side - and introduced himself as Terra. At the realization that these were deities he was facing, the dapple's ears turned back. Not pinned to show anger, no, just a returning unease at being in the presence of beings greater than him. Would they have the followers of her lunacy, though? He hoped not. It would be too terrible to arrive and realize this was not the place for him. The air was laced with the fine filigree pen of winter, frosted, clinging to each breath with a slow sigh of mist on a golden morn. It cast the earth into a fantasy, a dream, beautiful in its own solemn watch, stealing away from his gaze the hidden truths that laid just beyond the path. It revealed little to his eye, a silven hue of tempered steel, chilled as the lattice of melting ice clinging to his sides. It never lasted long, not as the night gave way to the wings of the sun, dawn rising as the eastern horizon bled its sacrifice into the transformation. Setting his copper hide ablaze, Judal appeared for a moment a character in this land of mysticism. The Jaghl peaks had seemed so insurmountable as a child, ominous shades twisting the simple pleasures of the valleys and meadows into harsh contrast against its jagged cast. A raw, unpolished masterpiece, how dominating it was in its sheer truth, untouched by time, enduring the scathing teeth of water and air. Once upon a time, these very paths had led him to ruin, the cruel lash of the whip driving even a child to conquer the monster. Fear, had a way of making even the weak something remarkable. Now, no such bite quickened his steps, a steady, rhythmic beat striking against ore and slate. Where the unyielding sheets of rock gave way to the feeble crumble of gravel, the stallion had made his descent, into the fairy ring that encompassed this strange world. He had expected to find the horrors of discord rending the earth apart, for the pagan arts to be awry upon the air, prickling his flesh and tasting electric upon his tongue. Judal in his travels to unearth the hidden truths of his own study had discovered such places, ruins where once mortals sought to possess the might of the divine, to cease control through aether and mana. Such things were never meant to be held, and for it, those who sought immortality oft found themselves greeting death but a little sooner. There was no pity to be offered in his heart, only a fevered apathy, a quiet scoff. Those who sought to fly too close to the sun would be burned, as was due for their treachery. Power never came cheap, paid in the blood and suffering of others. Judal did not return to the land of Pantheon to seek territory, vassals, or possessions, only to see with his own eyes the ruins of the hoard that had seen fit to place a bid upon the world and the weak nation that had done nothing until it was too late. Yet, as the mists peeled back, as the shroud was cast aside by the winds and light of a new day, it was not a place of destruction that rose amongst the water. A bridge of stone, carven and angular, unnatural. No rubble struck scores into the cobblestone, no passage of time had crumbled the railings to broken teeth, only a gentle, flickering flame of well-tended lanterns. A path of fireflies, leading out towards a solemn shadow, a sleeping giant that laid separate from the east. Rising, unfurling across the water, casting a shallow mirage against the ripples, the land held a gentle sigh of a creature newly woken. Judal gazed upon those shores, an ineffable convolution of thoughts warring in his mind. Part of him raged at the fallacies of the tales he had heard uttered, foretelling the destruction of Pantheon, the end of the Uruk and their cowardly puppets. Another, was confused, for he had never heard tell of a bridge such as this. And yet, another part, was intrigued, curious as to what laid in a realm that had should no longer exist. Perhaps it was this thought that continued the unrelenting march, hooves striking as hammer upon the anvil, the alchemist finding his way into the pavilion of a grand city. A ghost city, barren of life. There was something grotesquely unnerving about such a place, opulent in its winding streets, its rising, polished domes and pillars of marble, every few steps set aglow by the cast of lanterns dying into a whisp as the sun rose higher. Soon, the fire of day would spill into the streets, setting the gleaming banners of pearlescent clothe to a fine shine. Yet, he found not a soul as he passed, his eye taking in the silent storefronts, the alleys reaching out into the shadows, lances of light hanging feebly in the murk. It was a lonesome place, beautiful, gentle in a way none of the grander, more enduring cities of the east, places that had been ruled for centuries. But there was power here, it hung as a great weight upon his shoulders, Judals ears pivoting upon his crown to ever face north. It wasn't until he rounded the long stretch of road that he found it, the keystone of the city, the source of that unease that sent chills deep into his bones. Towering above all else, a temple of white and gold gleaming as a spire in the morning light, a sprawling berth of stairs leading towards its belly, lined with pillars and fine veils of silk. It was here, he discovered a spark of life, a gathering of equines, vastly different from one another, rich perfumes hanging pungent in the air. A furrow in his muzzle revealed his displeasure, ears once more turning taken in the muffled voices, his own gaze rising to see what it was that held their attention. A gathering of... beasts? His breath fell in a harsh snort, the sepian stallion strode forward, uncaring to the indignation that grew as he shouldered his way through the crowd. With each step, their voices grew, with each step, the confusion gave way to understanding, then distrust. They claimed themselves gods, creators of the new world. Their names were not ones he knew, made familiar of the Pantheon faith by the hushed tones of the nobles who had come to pay homage to Cassiam in his villa. He wondered how they would prove such a claim, for surely these so-called divinities would not expect the populace to blindly believe in their words. 'Mythos' may no longer be a desolate land, razed by magic, but there was nothing to truly tie creatures to its renewal. What do they have to gain from revealing themselves in such fashion. "Seems a waste of time for gods to act as gatekeepers." A disturbance among the gathered equines drew his attention to a stallion pushing his way through the crowd. He rose nearly to Tempest's own height as he passed by, the dappled grey easily sidestepping to allow him easier passage. A glimpse of a horn and trailing lion's tail were his only impressions as the other moved nearer to the front. His words, when he spoke, made Tempest hum in agreement as he thought about it. Odd, indeed, for beings such as these claimed to be to act as they were. Why show themselves at all except to incite fear or worship? Ever since the... incident of his youth, he had not met or heard of many divines or deities, whatever they claimed to call themselves, that had benign intentions. Even those who were not malicious in their manner cared for nothing more than how much power they could claim from their followers. With this in mind, he also moved forward, towards the stallion that had passed only a moment before. He was much gentler about it: Instead of simply shoving them aside with his greater bulk, he wove between, politely excusing himself when he had to pass between obvious friends and apologizing when he bumped into others. "He speaks true," Tempest agreed calmly, raising his voice just enough so he could be easily heard by those who cared. "You cannot simply be here to act as greeters. What do you wish from us?" That was the only reason he could imagine they would reveal themselves in such a way, though he might not have even confronted them had it not been for the stranger he now stood beside. A hare, the raven, a deer, and a pony. They were nonconsequential, creatures that were so easily forgotten, cast aside as lesser and weak. It was a perfect shield to hide a demon within, the predator far stronger than any would expect them to be. If what they did say was true, it would make sense to appear lesser than they truly were. And yet, a greater part of him found it a foolish. No creature of pride would ever kneel before something deemed lesser than themselves. Gods were beloved, were worshipped, for they were seen as greater than mere mortals, to reveal themselves for the first time as... simple creatures, killed the mysticism. It appeared he wasn't the only one to doubt, the sordid seeds taking root and festering in the hearts of the gathered. Murmurs, whispers, the crowd parting at his back. Casting a calculating gaze over his shoulder, Judal found his own mind rolling into the herd mentality of those who had come. Stepping forth to strengthen a single voice. It was in their nature after all, this need to create, to build. While the equine race had been proud, they had only built their legacy with the aid of others. Judal, however, had no desire in catching fire by the swelter of another's courage. He had chosen to voice his doubts, had stepped from the crowd to face these gods, a story of David in Goliath. A true test of their serenity. It is more than just why they choose to approach the newcomers of the land. Why is it they created Mythos at all. The gods who came before had chosen to let Atlantis fall into the sea. Why unearth it again? Shifting, his onyx hooves scoring grooves into the cobblestone, ignored the ache in his scars, the pull of muscle, only to once again step forward, straddling the gleaming marble steps. "You are not the gods who once ruled Pantheon. Why rebuild something of anothers gods design?" The unfamiliarity of this city leaves that same lingering sense of grief, but nothing of her demeanor offers the slightest clue to these thoughts. Skadi is an immaculate image of womanhood, a blue scarf covering most of her hair, except for the few blonde strands that escape under the fabric. Gold decorates her ankles and her usual crystal hangs around her neck. Quietly she witnesses the welcome from a distance and listens to the foreigners speak and her ears pin back against her skull. “It is quite ironic that we have foreigners questioning things,” Skadi coos, her voice sweet like citrus, stinging and . She steps forward and eyes the two stallions, so terribly unimpressed by their outburst. “I do not recognize any of your faces from those who stood against the plague the Uruk ravaged over this land.. So it certainly lacks regard for those of us who loved and lived in the land of Pantheon.” She longs for her magic, longs for that power that once coursed through her veins. She is feeling especially cruel and might have frozen them in their very place, but alas, she does not humor the likes of guileless men. Skadi lacked interest in the cliches of the atheist. She disregards the men and turns her attention to these gods, though not so inclined to bow in worship she stares at them. She stares at them, none of them the gods that had blessed her with Aqueous, none of them the gods that had unleashed the volcanic wrath across her home.. None of them are familiar and she still doesn’t react so swiftly with suspicion. Gabriel paused in the courtyard that held the citizens of this new city, just before the temple where four being stood upon its threshold. It was new and it made his skin crawl. The towering buildings seemed too young, as though they were children. They were not the welcoming spires of his home. Nothing more graced the man than his armor, a pauldron emblazoned with the sun emblem of his old home. A crimson sash cascaded from his one shoulder, a cape that could have once kept away the chill of the air, now a banner of a fallen world. He peered up at the temple, then back down to the ones who surrounded them. The words of the chocolate stag warmed his soul, but the words of the mortals that surrounded him sent a chill through it. He flickered his ears, uncomfortable and superstitious. But as Skadi spoke, it soothed him like a cool balm. He moved forward as well, his voice curling out like the smoke that once rose from his hooves. "Skadi. It has been a long time since the battle with the Uruk. Perhaps they were too young when the Horde came upon us. Not everyone was blessed with immortality like you and I." Gabriel could not remember having spoken to the Heimal Queen before, only catching glimpses of her at parties and festivals. He could distinctly remember her at Narcissus's Incendiary Ball though, her glittering mask of ice obscuring parts of her face. But he could not recall her battling along the front, though he was admittedly quite busy with the Uruk that seemed to come from the hills like swarms of rats. Gabriel turned his head towards the Temple, focused upon these new gods. They were oddly reminiscent of the old gods he had worshipped but still different. They seemed younger, more vibrant. Full of a vigor that the old gods had seemed to lack. "Perhaps these new gods have a plan for us that the old ones did not. Perhaps they shall choose not to blow up our Capitol at a time when we need them the most. Perhaps only time will tell what is in store for us." He spoke to everyone and to no one at the same time. Perhaps it was better to simply listen than to create enemies of these new gods. The new and the old arguing at the feet of gods. It felt so remarkably like the lands these had once been, where the gods walked above them and mere steps below them royalty stalked with their poisoned whispers, worshipped as false idols and insignificant beings of power. Since then, since his brief time upon the throne of Incendiary, Jai had known true immortality, he had walked lands far from Pantheon, lost love and found it again. He had tasted the power of deities and walked the path of the divine, only to be brought to back to violent, burning mortality by the same blade that had gifted him eternity. His ancient, fiery eyes met the gaze of the new deities. They were fresh, new, sparkling. They were too naive. Too new. The weight of the world had yet to wear on them until they were distant, floating avatars of indifference. And so the great beast of flames and ash turned to the gathered. New and old alike bickered. His kin, the few scattered souls who survived the fall, or left Pantheon long before it fell to war and abandonment, were those he had detested before. The womanly, pristine perfection of the once Queen of Ice spoke harshly of the newcomers. He found her no less grating than the last he had seen her; the flawless Ice Queen with her throne guarded by tempestuous waters and the wills of the gods. The chill of her gaze, the careful selection of her words, brought flickers of flame burning within his lungs, burning in his chest to warm him from her cold. He regarded her with burning contempt. He waited a moment, ash on his breath and the ground beneath his feet smoking, sizzling, with the heat barely contained by his flesh. Then his burning gaze moved to the next of the old stock. The male had hair like coal, skin scarred from battle and Jai…He recognised him from what Mythos once was, but he could not recall his name. He considered for a moment, then in the same rough growl spoke. Slowly, his focus returned to the vibrant young gods. They glowed with vigor, fresh, new and sparkling. There was hope in their brightness, and before them, Jai felt the weight of his life weighing upon his shoulders. What a strange thing to be older than the gods that made the stone he walked upon. The reception by the first handful of citizens was mixed. Those who were new to the ideas of Pantheon seemed untrusting of the deities, scornful of how they spent their time gatekeeping and not watching over them like childminders. At Judal's accusation, Morta scoffed. Her reaction was met with an unkind gaze by both Aeternitas and Terra, but she paid the stares no heed. "It's a waste of our time to be watching over you petty fools at all." she spat, and though her siblings frowned at the choice of words, they could not deny their agreement. "We wish nothing from you, not now, not yet," she sneered, despite the fact that in truth there were no plans to ask anything of these citizens as of yet, "But you two will be the first I, for one, come to if ever I need a set of hooves to perform my dirty work for me." It was now that Aeternitas stepped directly in front of the sharp-tongued raven, ignoring her petty grumblings as she made an attempt to soften her features and directed her attention away from the two newcomers - focussing instead on those who had returned to Pantheon after all this time. In one cool response, she addressed Judal before Skadi, "Forgive me, but you did not see the mess that Pantheon was. Mythos is not Pantheon. The way Pantheon was left, it was completely inhabitable to you mortals. Do not underestimate the work we put in to open the gates of Mythos to civilians once more." Her tone loosened slightly as she finished, mindful of Skadi's words that acted in the Deities' defense. Though the reigning four had no power over Pantheon, the world was revered amongst the heavens for being one of the most flourishing kingdoms under the control of divine minds. They had certainly watched over the lands, and consequently knew most of the previous residents by name and by character. "Skadi, it's good to see you here." she offers a soft smile, "The lands of Pantheon that remain are here as both a reminder of the tragedies endured and as a comfort to you who came back to us after so long. Not only that, but it seemed a waste to reconstruct the lands that stood strong after the apocalypse." the Deities realised that the lands may not be at all comforting to a number of previous Pantheon dwellers, but the notion was still the same. Aeternitas glanced back at Morta for a brief moment, who only scowled and continued her quiet muttering, "It is in our interests to be fair." she agreed that they were more hospitable than the previous Deities, "But do not be mistaken that our wrath can be just as powerful. We encourage you not to invoke such angers." The Deities simply watched as Gabriel and Jai Oiscere took their places in front of the steps, listening absentmindedly to their conversation. It was futile offering insight - they already had their standpoints. Instead, Suadela, Morta, Terra and Aeternitas waited for Jai's last words to ring through the air before the quiet shetland stepped forwards, "Thankyou for greeting us," they said, "Today is far from the last time you'll be hearing from us." it was possible their voice held a note of foreboding in it, as if there were plans, inklings of something - or things - happening in the future that would require their attention besides simple conversation. "Farewell. Treat each other with kindness." Suadela sidled backwards into the shadows, where they seemed to simply disappear. Shortly afterwards, each of the remaining three siblings seemed to disintegrate. Within moments, the steps were bare. feel free to continue interacting! He had spoken, and the rest of it simply blurred before his eyes. More emerged from the crowd besides the one who seemed to so easily dismiss him and his presence: A mare, scorning him and his words, Tempest's ears simply tilting back to show his displeasure at her displeasure and biting tone; a stallion who spoke up in opposite of the mare, though he did not speak in any particular being's direction; another stallion, whose greeting to the mare called Skadi was vicious and profanity-laced, and his hope was to be left alone by these deities who were so new. The deities themselves did not keep silent, though they seemed background compared to the mortals he would find himself interacting with more. Only the conversations that continued beyond him, before he had chance to draw breath and respond on his own, kept the silence of his tongue. However, at the departure of the creatures, he did not silence his noise of disapproval. "So willing to speak and introduce themselves, yet they leave before a true exchange can be made. They simply answer and leave." His words were not spoken too loud, not reaching those at the very steps of the Temple, but nor were they quiet enough to be drowned out by the sounds of others mingling and leaving. Tempest spoke just loud enough for those nearby to hear him should they be paying him any mind. He took the chance to slip among the crowd and lazily make his way through the winding streets once again. Perhaps this time he could find a land that resonated with his magic? Surely there would be such a place. "He speaks." | He thinks. @Judal @Skadi @Gabriel @"Jai Oiscere"